Our weekly “Favorite Finds of the Week”…Two out of three had me cracking up! Here we go! 1.) SNL Skit: “Tech Talk”, and the Problems of the iPhone 5 – this one is a must-watch – it had me rolling. 2.) The BEST dog accessory – ever. It is a ball, and this is what it looks like in a dog’s mouth. 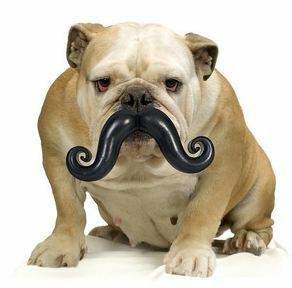 For all of you who want your furry friends to participate in Movember, your wait is over. You’re welcome. This is hilarious! I don’t even own a dog and want this. This is actually mean of me to share with you, because they are currently sold out, but you can see the site where you can order them here. Fingers crossed these come back in stock. Would it be weird to give this to a cat? 3.) Secret Pinterest Boards. For all of you die-hard Pinterest fans, if you haven’t heard yet, Pinterest just launched their “secret boards” feature. This is great if you want to collect a visual idea board for a project or event that you do not want anyone to know about yet. Think surprise parties, new babies on the way, and other events you want to keep on the DL. You can even collaborate with others if you want. Just log into your Pinterest account, go to your boards, and look at the very bottom of your screen to create secret board (as you can see below.) You get three to start. Not on Pinterest yet? Get on it!! Now’s the best time of year to see all the great ideas out there. If you have any trouble becoming a member, message me and I’ll send you an invite! previous article: Free Holiday Gift Tag Printables!